…As a pioneer in microscopic research, Hooke was familiar with small dimensions…he had observed 'animals' in rainwater that were no bigger than a thirteenth part of the breadth of a hair. This would mean one cubic inch could contain 'eight millions of millions' of these minute creatures. In the human brain, it would appear, there is no such thing as a lack of space. What is truth? A mobile army of metaphors. I first saw Yigal Ozeri's Untitled: Shely, 2011 from a distance. It impressed me as a magnificent panoramic painting, with a "photographic reference," as Ozeri says. It is a huge work, 8.5 by 14 feet, picturing, in the foreground area, the dark and straight haired Shely, a young Israeli woman, wearing a brown military uniform-she's a sergeant, as the three stripes on her right sleeve indicate, suggesting that she's been seasoned in battle, and a leader-and below her, a young blonde and curly haired woman in a red and white striped bikini bathing suit. An equally young woman, her pitch black hair carefully shaped like a stylish helmet, in contrast to the loose hanging, slightly unkempt hair of the other two woman, appears between them. All three appear on a huge mound of raw stone, a breakwater and barrier between the blackish-blue, peculiarly ominous Mediterranean Sea on the left side of the picture, and the modern city, still under construction-perhaps the suburban outskirts of Tel Aviv-on the right side of the picture. The barren rocks-there's no moss or any other growth on them--extend into the remote distance-virtually to infinity-and into our space. The contemporary buildings look inconsequential compared to them-a small island of civilization in a wilderness of rock, a man-made wall of elemental material, piled up to form the outer wall of the Fortress Israel, and evoking the wailing wall, the crumbling remaining wall of the great Temple of Solomon that once existed in ancient Israel. Like the old wailing wall, the new wall of stone is marked by scars, signs of duels to the death with enemies. But the new wall is not a sacred relic and ruin, but prophetic of a strong future, a promise of a restored and heroic Israel. A bulwark guaranteeing Israel's security, it resembles a map of Israel--also a narrow strip of land in the north, widening in the south (a head on a body, metaphorically)--and looks as sterile as the desert in which Israel flourishes, suggesting that one can survive in a desert, and that a barren desert can become a sacred space. A couple, presumably a man and woman-a new Adam and Eve, as it were, ironically leaving the desert for an urban paradise--walk on the broad, flat path that leads to the city, with its housing developments. It is somewhat narrower than the broad sea, also flat and peculiarly static however alive with ripples; both bracket the more multi-dimensional, complexly shaped stone barrier, isolating and emphasizing it. It is clearly the centerpiece of the picture, but then Shely is also central. She has a similar defiance, authority, autonomy, grandeur, suggesting that she's inwardly as rough, tough, and invulnerable as the rough, tough, impregnable, and grand boulders. She proudly stands on top of them, as unflinching and powerful as they are: they are brute matter and she is the energy they contain. Shely stares at us, undefeated, apart, and triumphant, her right sleeve rolled up to reveal her soft skin-she's not entirely as hard as the stone, although under her skin she's harder than it-and wristwatch, suggesting that she's aware of time, ready to be moved to action at a moment's notice, unlike the passive, inert, timeless stone, with its strangely terrifying surface, and stubbornness, which is what the Jewish people were said to be by the Romans who conquered them, for they refused to humble themselves before the idols of the pagan gods the Romans worshipped. They resisted the Roman conquerors, and remained upright and unconquerable, spiritually, and even physically, like Shely. The upright soldier wears military boots, confirming her sturdiness and courage; the two other women are barefooted, suggesting their closeness to nature-the "earthiness" that underlies their attractiveness. All three are pretty, if not classically beautiful. But the soldier is a modern version of the classical Diana-a hunter who lived in a dangerous environment-and the two virginal females who accompany her, and whom she protects, are her nymphs and devotees. None of them are particularly seductive or voluptuous-they're physically fit, as their slim, athletic bodies indicate-but for all their purity they have a certain affinity with Venus, who was born from the Mediterranean Sea: the heap of stone is a paradoxical island of Cythera, where she first came ashore. 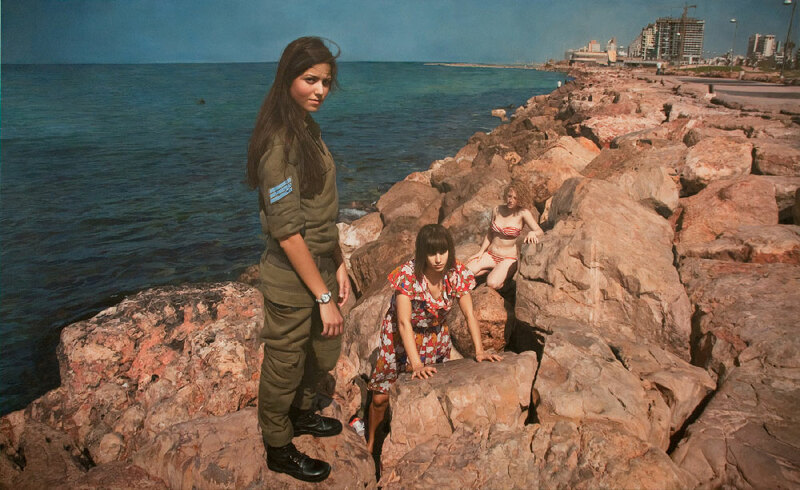 Time may be running out for these young Israeli women, as it is for the young state of Israel-the sergeant's watch is the closest object to us, suggesting that even nature is running out of time (the brackish looking Mediterranean suggests pollution; it looks like a Dead Sea)-leaving only a desert of stone in its wake. On the strictly surface level, Ozeri's picture is inexhaustibly rich with allusions and metaphors, giving it art historical resonance and credibility, and cognitive subtlety: perception is enriched with unexpected yet unavoidable meanings. When I came close to the picture, I was astonished to see the stones dissolve into an abstract mess of painterly details. The hard material softened into a dense matrix of fluid gestures: the desert of inorganic stone had blossomed into an aesthetic paradise, a sort of wonderland of organic expression. What seemed impenetrable had been penetrated by the painter's probing eye. A sort of querulous, passionate, agitated texture emerged, giving the work emotional power-a power that seemed to subvert the calmly composed image. The image invited prolonged, careful contemplation; the spontaneous gestures invited one into the artist's creative process, instantly absorbing one in its energy and flow. The "soul" of the stone-and artist--was revealed by his "soulful" attention to it. What seemed inert and matter of fact suddenly became alive and felt. My consciousness had abruptly altered: my physical eye and my mind's eye intersected and interacted. Denotation and connotation, the explicit and implicit, the expected and unexpected, the familiar and unfamiliar, the observed and the intuited, the manifest and latent, external appearance and internal reality, uncannily converged. It was the same "double vision"-the same sense of the inextricability and interplay of surface and depth-that the best Old Masters were able to achieve. "Double vision" gives a painting inner grace, and is a sign of its aesthetic success. Up close, Ozeri's female figures also became a sum of intricate details-impersonal pixels of data, with a painterly edginess, giving them "personality"--each implicated in the other however ostensibly different. The figures became peculiarly intimate-not quite the "speaking likeness" traditionally understood as the goal of portraiture, but a sort of "whispering likeness," better yet a sort of silent witness to unspoken feelings. I felt I knew and shared their emotions more than they wanted me to-their pensive expressions, however different, seemed defensive, masking their inner life even as it signaled it-by way of the "touchiness" with which they were painted. It is a special kind of touchiness, a revolutionary synthesis of precise machine-made touch and idiosyncratic hand-made touch. Paradoxically, the new digital "touch," made possible by the digital camera, quintessentializes the old tache (touch, patch) typical of modernist painting since it first appeared in Manet's Music in the Tuileries Gardens, 1862. (3) As Anton Ehrenzweig famously argued, the haptic touch is the manifest form of latent feeling,(4) suggesting that the digitalized touch refines and focuses feeling while giving it scientific credibility: Digital PhotoRealism is an exquisitely new Pointillism. PhotoRealism has changed the character of mimesis forever, just as the digital camera has changed the character of perception forever. The excruciating consciousness of detail and grand vision of reality it makes possible are not altogether unprecedented in the history of realist painting, as the use of the camera obscura in the 18th century makes clear. It was an instrument of drawing-"Say, rare Machine, who taught thee to design? / And mimic Nature with such Skill divine?" John Cuff, "a London dealer in optical instruments," wrote in 1747. The development of the pre-digital camera, able to fix and preserve, that is, permanently remember and store images, was a greatly improved machine for mimicking nature. "You cannot imagine how exquisite is the fine detail portrayed," Samuel F. B. Morse wrote to the New York Observer in 1839. He was then a portrait painter and Professor of Design at New York University, and responding to the "almost unimaginable sharpness" of one of Louis Daguerre's silver plates, probably the view of the Paris Boulevard du Temple that he photographed in 1838. Daguerre was "a scenery painter with a predilection for illusionistic effects" which he carried over into photographic representations of urban scenes. "No painting or engraving could ever hope to touch it" [Daguerre's photograph]," Morse added, suggesting that the photographic means of making art had superseded and replaced the traditional means. For Morse, the purpose of art was to picture reality, and the photograph could do so better than the painting: the traditional art of painting by hand had to give way to the modern art of photographing with a camera because the camera eye "revealed 'a minuteness of organization' the existence of which no one suspected," that is, which could not be seen by the painter's unaided eye. Thus, looking at Daguerre's cityscape, Morse noted that the "tiny signs" on "a distant advertisement hoarding" could not be "read…with the naked eye," but "with the help of" the camera's lens, "pointed at this detail, each letter became perfectly clear and visible, and it was the same thing for the tiny cracks on the walls of buildings or the pavements of the streets." A "totally new kingdom" of vision, discovered earlier with the aid of the microscope, had been conquered by the camera: a sort of Shangrila of luminous details, an unprecedented number of unexpected facts, ordinarily invisible and unconscious because they were below the threshold of ordinary vision and consciousness, but brought to consciousness and made visible by the extraordinary invention of the camera. Morse thought of the camera eye as a sort of enhanced artificial eye, more capable of "scientific research" and "exploration" of reality, and thus more "clear-eyed," than the natural eye--superior to it, all the more so because it would not deteriorate with time. For Morse the photograph was inherently scientific, and as such made unscientific painting obsolete. It was not simply a substitute for painting, but superior to it. It was an impersonal means of representation, because it was untainted by the artist's personal vision, and thus truer to the impersonal character of reality-the "not-me" and "separate" quality of reality, as D. W. Winnicott put it. Projecting his feelings into reality, intentionally or unintentionally, by way of his handling of the medium, the painter corrupted conscious understanding of it. For Morse, the subliminal came into its own with the camera, and even more with the digital camera, for it showed that minute details had a minute structure. It had a digital form, in the double sense of digit; "digit" could mean number or finger. The two meanings converge in the use of the breadth of a finger as a unit of linear measure-a unit of information or datum. In Digital PhotoRealism the finger's "touch" is in effect the measure of space. The photo-realized figure is so many fingers-digits--high, not so many heads high, like the classical figure. It is more particular, less broadly conceived. Each minute particular detail is sort of a fingerprint. But without paint the photo-finished detail is anonymous, and the photograph incompletely art, for to become art a photograph must have a "personal touch." It is then no longer only "found" information, but creative interpretation. The use of paint to accent and emphasize each detail, reinforcing its presence and individuality, announces that it is the artist's very particular fingerprint, underscoring the personal character of his choice of detail and the individuality of his vision. The digital camera is a virtual storehouse of information, capable of subliminally containing an infinite amount of data, like the human brain, to recall Hooke's idea that "there is no such thing as a lack of space" in it. This opened the way to a new concept of sublime space. The old sublime space was "daringly empty," as Robert Rosenblum wrote. From "Turner's 'pictures of nothing'" to "the boundless voids of Barnett Newman" it was "negative" and impalpable, however mystified into spiritual significance. (6) The new sublime space is densely packed with minute detail, intricately organized and palpably concrete. We are not dealing with what Rosenblum called the "abstract sublime"-the empty sublime-- but the "realistically sublime"-sublime plenitude. The old abstract sublime is a sort of wasteland in which details dissolve in a void; the new realistic sublime of Digital PhotoRealism is a cornucopia of details, many never before seen with such startling clarity, many previously unseen but now uncannily close. The effusive richness of detail in Digital PhotoRealism, its appreciative attention to the slightest nuance of fact, its celebration of "phenomenal" presence, is the healthy perceptual and cognitive alternative to the abstract sublime, with its perceptual alienation from and cognitive indifference to reality. There is a serious failure of reality testing in the abstract sublime, in contrast to Digital PhotoRealism, which extends it to micro-reality, just as Pre-Digital PhotoRealism expanded our sense of macro-reality beyond the limited capacity of the naked eye. Ozeri has given us a narrative masterpiece worthy of the great Old Masters. Landscape, cityscape, and portraiture cognitively, formally, expressively associate to allegorical effect. As in Old Masterpieces, every pictorial ingredient has a symbolic and spiritual meaning. The spine of the picture is the stone barrier seen in mannerist perspective. Its strange, restless form encapsulates the strangeness of the scene, and suggests the restless inner life of the Israeli muses and their precarious positions on the stone. However dead and heavy, the turbulent river of stone moves swiftly, suggesting the swiftness with which the modern, liberated Israel woman can move, should she have to. It is this use of traditional methods and ideas-about how art subtly conveys meaning, and the serious meaning it aspires to--that saves the Photo-Realist picture from becoming a journalistic record of a transient event, not the computer manipulation and alteration of its source images or "photographic references," as Ozeri calls them. The use of the computer to modify mechanically reproduced images is standard modern operating procedure: it is a means not an end-a method that must serve an imaginative end. Unless it does so it is just another technical gimmick. Ozeri's work is overtly a historical painting, covertly a religious painting-it deals with contemporary history and religious conflict--both of which became passé with modernism, as Charles Baudelaire noted in the 19th century. I suggest that all the Digital PhotoRealists are indebted to the Old Masters, not only because their Photo-Realist representations are as skillfully made and ingeniously meaningful as theirs, but because of their idealizing realism-the finding of the ideal in the real, and also the real in the ideal. They idealize in the process of "realizing," and "realize" in the process of idealizing. They idealize the real the same way classical art does, as their portraits, landscapes, and cityscapes show, and realize the ideal as their formal beauty shows. There is a "classicizing" tendency in their art, in the sense that they aim for perfection and harmony, establishing what Kandinsky called "absolute equilibrium" between observed objects and pure forms, all disparate and seemingly aesthetically incommensurate with each other. More crucially and basically, from an art historical point of view, they restore what Kandinsky called the "welcome complementation of the abstract by means of the objective and vice versa"-the formal and the realistic poles of art, as he also called them-that existed in traditional art and was lost in modern art. (8) Whether dealing with an object in a kind of still life, as in Peter Maier's Digital PhotoRealist paintings of automobiles-seen up close they overwhelm the viewer, engross him in their detailed form--or with a sweeping cityscape, as in Anthony Brunelli's pictures, or with street scenes, as in Bertrand Meniel's works, with their steep mannerist perspective diagonally cutting through the scene like a sharp knife, suggesting its absurdity, and perhaps the absurdity of the modern world and architecture (several are reminiscent of Gustave Caillebotte's Paris Street: Rainy Weather, 1877, but without the people)-there is a kind of nostalgia for the grand tradition of classical realism in their art. This nostalgia is all but acknowledged in Maier's portraits of "classic" automobiles-so they are, as their "facial expressions" (and titles) indicate. There is an implied reference to Gustave Courbet, Thomas Eakins, and Edgar Degas, all of whom enlisted photography in the service of painting, and all of whom relied on photography for their acute sense of detail. And all of whom accented and intensified it with "personal touch." It was photography that enabled each to become what Raphaella Spence eloquently calls an Abstract Observer, to refer to the title of a photo-realistic painting of an idealized landscape she made in 2007. There's a field of yellow sunflowers in the foreground, an earth-colored mountain range in the background, and a line of green trees in the middle-ground, all the colors, forms, and objects skillfully described and ingeniously balanced. The key to the work is light: whatever else they represent, Digital Photo-Realist paintings offer perhaps the most acute observation and representation of light-and shadow-in all its changing subtlety in the history of Western painting. It was made possible by the digitalization of light-the recognition that it is a quantifiable compound of pulsing particles. It may take wave form, giving it a variable quality, as in the reflections that haunt many photorealistic paintings, but it remains succinctly "particular." The complex dynamic interplay of light and dark, with its unexpected moments of "stand-off," in Robert Gniewek's Kronenhalle/Taxi Stand, 2008 and Times Square #7, 2010, is strong evidence for my argument. The dynamics is less intense in Bernardo Torrens' Laura II, 2009 by reason of its colorlessness-it is painted in nuanced tones of white, black, and gray-but equally engrossing. Her body, that of a classic passive odalisque, hypnotizes us with its physical beauty and harmonious proportions-its "classic" perfection"--and its nuanced tones are "touching," and activate her flesh, making it more hypnotically fascinating. However engaging its comical wit, Don Jacot's Popeye on Broadway, 2011 has its "carrying power" by reason of its "registers" of light and dark, sometimes at odds, sometimes blended, as in Popeye's pants and the cloth that forms the top of the car behind him. Digital Photo-Realism is haunted by contrasts of light and dark, which it thematizes into the substance of reality. Light is ideal, immaterial, and life-giving, and darkness seems materially real and deadly, suggesting once again the "double vision" of reality-a peculiarly fatalistic, at times Manichean vision--that I think is the fundamental "theme" of Digital Photo-Realism. It is evident in Pre-Digital Photo-Realism, but fine-tuned in Digital Photo-Realism. This double vision-the sense of the simultaneity of the ideal and the real, the ideal embedded in the real, the real a concretization of the ideal-is especially evident in their use of reflection, with its peculiar distortions and dreaminess, its twisted images of reality and "fantastic" images. Automobiles are Dream Machines, 1997 for Maier, because our dreams-wish-fulfillments, as Freud famously argued-are mirrored in their reflective surfaces. A dream is a distorted picture of emotional reality, wonderful and strange because it is a wish come perversely true, an ideal made real. Maier's classic automobiles are ideal and real at once. To own one of the classic-"classy"-automobiles he pictures, with a clarity and appreciation greater than any advertisement of it, is to realize the American Dream. We have moved away from the reflection of the outer world, which is what we see in the Old Objectivism of Jan van Eyck's Giovanni Arnolfini And His Bride, 1434 and the New Objectivism of Otto Dix's Dr. Mayer-Hermann, 1926-the former uses a convex mirror on a wall, the latter the mirror-like surface of a circular X-Ray machine, to render the space outside the picture-to the abstract reflection of the inner dream world. The double vision of Digital PhotoRealism gives its subject matter-and it addresses and encompasses every subject matter, empirically exploring landscape, cityscape, still life, and the figure with patient curiosity and devoted attention-a mythical grandeur and unexpected depth of meaning. The subject matter acquires an import beyond its immediacy and everydayness, however amazingly immediate and contemporary it remains. It is what the best art has always reliably done: make whatever it represents seem timely and timeless at once, clearly of its time and place while transcending them. Digital PhotoRealism at its best offers us an epiphany of reality, as though it was foreseen not simply seen in passing, fated rather than an accidental appearance. Again and again surfaces function as magically distorting "illuminating" mirrors while remaining flawless, perhaps most noteworthily in Roberto Bernardi's Bombay Sapphire, 2007. The rippling water in Spence's Moments, 2007 is also magically reflective and absurdly abstract. The amorphous ripples, many colorful, have an abstract expressionistic irregularity, even as they systematically repeat with geometrical regularity, confirming that they are more structured than they appear to be at first glance. The water and the reflection in it seamlessly unite, yet they remain at odds. To see this doubleness is peculiarly disillusioning, but without it the illusion of reality is unconvincing. At some place in the picture realistic appearance must spontaneously self-destruct so that its abstract reality becomes self-evident. The representation must disintegrate into abstract fragments-show its enigmatic formal underside, as it were--to become a felt and convincing illusion. The best realism involves a "reflective" moment of disbelief in the representation which awakens one to the abstractness of what one experiences as real. One is tempted to call Digital Photo-Realism a species of Magic Realism, but its distortions, however also "surreal" and meticulously rendered, are not as abstractly realistic as those of Digital Photo-Realism, and certainly not as idealistic and detailed. Like early realism, Magic Realism uses detail as filler, frequently contained by architecture, as in the religious realism of Jan van Eyck, whether the architecture of the cathedral, as in his Annunciation, ca. 1428, or the architecture of the altarpiece--a simulated miniaturized cathedral--as in the Ghent Altarpiece, ca. 1425-32 (painted with his brother Hubert). Detail had no meaning in itself: it had to be imbued with the glory of God to have meaning, lose its worldly character and seem otherworldly, evoke his presence and signify his majesty, testify to his creative power. It was profane until art made it seem magically sacred by ideologizing it. Similarly, in Magic Realism, detail has meaning only because it is imbued with the glory of the unconscious, the ideological God that modern art has worshipped since Odilon Redon said the artist must wait on it for inspiration. In Digital Photo-Realism, which is an advance on religious realism as well as 19th century realism and photographic realism by reason of its more radical positivism-its deep respect for minute detail, both as a quality and quantity of reality, its recognition that reality is a matter of details, that the stronger our sense of detail the stronger our sense of reality-secular detail is the structural essence of the picture. As Mies van der Rohe said, "God is in the details," which may or may not be the case, but only the digital camera can encompass them in their differentiated variety, while Mies could only attend to a select few. (1)Douwe Draaisma, Metaphors of Memory: A History of Ideas about the Mind (Cambridge, UK: Cambridge University Press, 2000), 56, 58. All subsequent quotations are from Draaisma, unless otherwise noted. (3)In 1867 the critic H. Babou perceptively noted Manet's "mania for seeing things as patches," particularly in the portraits in Music in the Tuileries Gardens: "the Baudelaire patch, the Gautier patch, the Manet patch." That same year Zola observed "that those patches live." Years later so did Cézanne. It is because of the "plenitude" of these "color patches" that Music in the Tuileries Gardens can "without constraint be regarded as (more than Le déjèuner sur l'herbe, which art history has generally cast in the role) as the earliest true example of modern painting, in both subject matter and technique." Francoise Cochin, Manet 1832-1883 (New York: Metropolitan Museum of Art and Paris: Editions de la Réunion des Musées Nationaux, 1983), 126. It is in Manet's revolutionary painting that what Baudelaire called the "crowded world" of "modern [urban] life" and what Clement Greenberg called the "frank [polytonal] surface" of "positivist painting" first made their appearance. The patches eventually became the "exceedingly minute fragments" of which digitally photo-realized objects came to be made. (4)Anton Ehrenzweig, The Hidden Order of Art: A Study in the Psychology of Artistic Perception (London: Orion House, 2000), passim, argues that there is a "hidden order" of "spontaneously applied form elements," which may be organized into "gestalt forms" in macro-vision, but "unconsciously scanned" and "attuned to" in micro-vision show themselves to be idiosyncratically individual details with an expressive complexity of their own. (5)Draaisma, 13 argues that "the essence of metaphor is that associations from two domains come into interaction and that the product of that interaction is a new meaning," more particularly, "new insights."